Some will remember a particular May 13th (click here). But, on May 13th, our GEO perpetual calendar A photo (of cat) a day, there’s a flamboyant ginger cat, who reminds us of someone, whom we’ll never forget. Free to do what they please all day long, alley cats settle on the roofs of the highest houses, favourite observation posts. The slightest rustle of wings or the races of the rodents trying to escape under the tiles are for them the start signal of a chase that belongs to playing and hunting. This entry was posted in Non classé and tagged 1958, calendar, GEO, May 13th on 14 May 2018 by Le Maitre de Frimousse. J’ai cherché comment traduire “chat de gouttière”. Une gouttière c’est le conduit d’évacuation d’eau du toit. En fait un chat de gouttière c’est l’équivalent, pour un chat, de bâtard pour un chien. Mais ça signifie aussi un chat qui n’a pas de race définie. Un chat haret c’est un chat domestique qui est devenu sauvage. Rien à voir avec le chat sauvage d’Europe qui n’est pas apparenté au chat domestique, qui descend du chat sauvage africain. Le chat de gouttière de la photo est un chat des rues, comme les chats des Aristochats. I didn’t know how to translate “chat de gouttière”. “Une gouttière” is a gutter, the exhaust pipe that brings down the water from the roof. In fact “un chat de gouttière” is the equivalent, for a cat, of mongrel for a dog. That also means a cat that is not purebred. But now we often say “chat européen”. “Un chat haret” is a domestic cat that became “wild”. Nothing to do with the wildcat “chat sauvage” of Europe that is not related to the domestic cat, whose origin is the African wildcat. The ordinary cat of the photo is “un chat des rues” (that is why I used the word ‘alley’), as cats in the Aristocats. I’ve answered your comment in French too in case some visitors are interested. Thanks for the info! We don’t really have so many different definitions for cats in English! Feral does mean dangerous but has just come to mean a cat that has never lived in a home and was born wild. 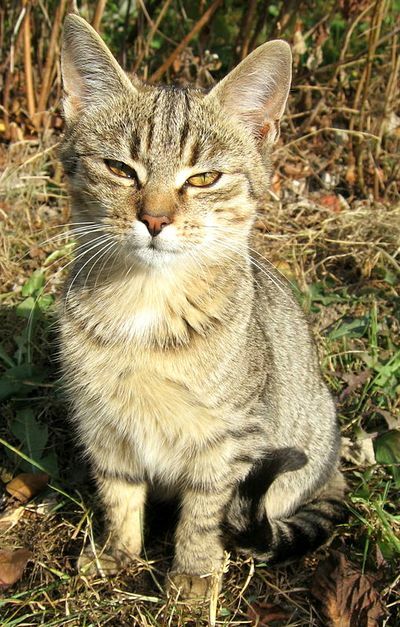 Stray is even more general–it can mean feral or a cat that was once a house cat but now lives in the street! 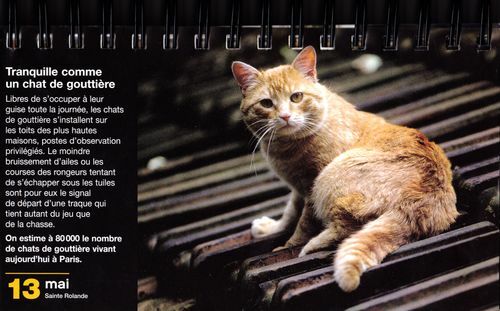 The photo shows… “un chat sauvage”, a wildcat. But does this cat look very different from one of our kitties? Or one of those “chats harets”, your stray cats? A wildcat is a protected species. Domestic cats are not on the list of huntable species. But “chats harets” are! Therefore hunters that are fond of shooting will shoot cats in the forest or in the fields , whether they are wildcats, domrestic cats or stray cats. In case of someone makes a complaint, the lobby of Hunters (*) is so powerful that no one is ever prosecuted! Terrible about what hunters will do! I am not sure but maybe those wild cats are like our feral cats!